It was an early start for both of us, as we still had course work to finish up and housework to do before our flight. David had it in his head that if he woke up around when a Swedish morning would start (about 3 or 4 am), then he wouldn’t suffer the effects of jet lag too severely. It ended up being about 6:30 am when D woke up, but it was a nice effort. Somewhat ridiculously, my statistics final was being distributed at 8 am, so I spent a fair bit of time obsessively refreshing the page so I could get started on it. It was a race-to-the-finish end of quarter, with me completing at least a first pass on the exam, D finishing his psychology paper, cleaning out the fridge and doing all the dishes by our 1 pm cab. Bizarrely, on D’s walk with Giz, the leash broke, so we had to order a new one for Vanessa to use (ah the madness). Gizmo, in amidst our preparations and our luggage conspicuously waiting at the door, had clued into our leaving and was moping around the house, trailing after us with sad eyes. We were both sad to leave him, but were comforted by the knowledge that at least he wouldn’t be alone. Even after we left to wait for our cab, we heard his barking from the apartment, and saw that he had jumped onto the back of the couch and was staring at us longingly through the window. D ran back up to comfort him, and we were soon on our way. It wasn’t long before we were at the airport and running through security; however, we soon discovered, upon making it through, that the international terminal at O’Hare has no hot food (it’s all under construction, somewhat indefinitely). The only food would’ve been right next to the security line, before security. We were desperate for something to eat, so I went and got our McDonald’s and then proceeded to wait in, what had become a much longer, passport line and then go through security again. While not probably worth the lukewarm burger, it was a way to kill time, certainly, as we were soon on the plane and settled in for 8.5 hours. For whatever reason, I wasn’t able to get much sleep, 3 or 4 hours at most, and David was much the same. So it was with bleary eyes that we peered down at the snowy landscapes and frozen lakes of Sweden. Disembarked, custom-ed and bags in order, I had a bit of a scare with my credit card. My Canadian credit cards have chips, so I had assumed it wouldn’t be a problem. However, upon trying to purchase our airport bus tickets from an automated kiosk, it informed me I had an invalid chip. This was somewhat distressing, as that had been my planned primary source of money for the trip. Thankfully, someone at the visitors information desk was able to run my card on their machine and the crisis was averted. Upon stepping out of the airport, one thing I should probably note is that it was snowing–heavily. Ah, spring break…in wintery Scandinavia. It was short ride to the central station in Stockholm, and we were soon off the shuttle bus, getting our bearings. A couple of years of extensive smartphone map use has apparently made us less competent at deciphering maps. We ended up dragging our bags on those snowy, gravel-strewn sidewalks in the completely the wrong direction before finally turning around and taking a somewhat circuitous route in the right direction. When we finally circled back to the other end of the central station. Tired from dragging our luggage around, we ultimately just hopped in a pricey cab to take us over to our hotel. 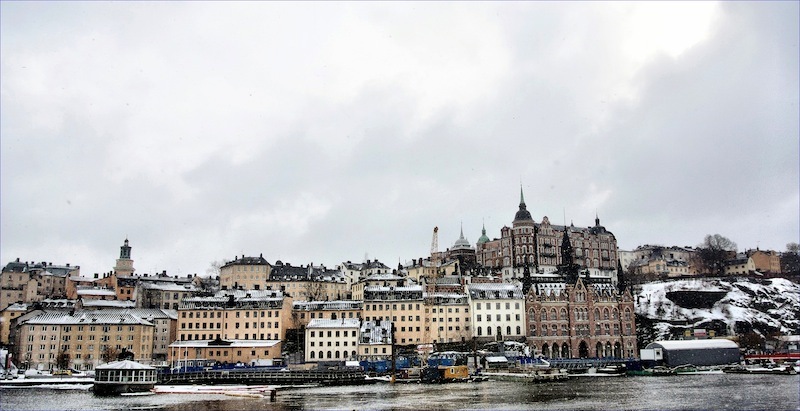 What I hadn’t realized before doing my research on Stockholm was that the city is actually situated on 14 little islands. Accordingly, there are a fair number of accommodation options on converted boats, so I decided it might be fun to try one out. I got us a twin cabin (bunk beds!) on Den Röda Båten (the Red Boat). We were able to stash our luggage at the hotel and then headed off for a bit of exploring. In my head, I had pictured all these little islands being connected by these cute little bridges that would be easily traversable; however, getting around turned out to be a bit cumbersome. We eventually found the right stairwell and underground corridor to take us into Gamla Stan (Old Town). Dating back to the 13th century, this part of town was a maze of cobbled streets, and medieval and Renaissance style buildings and, unsurprisingly, its fair share of kitschy tourist shops. The falling snow made for a muffled, peaceful air, and it was a pleasant walk. However, a desire for something to eat after our long flight soon presented itself, and we ultimately decided on Stortorgskällaren, a nice looking place with a fixed lunch menu for 95 SEK ($15), which I thought to be not a bad deal given the general expensiveness of everything. Our waitress was kind enough to explain the Swedish-only menu, and I went with the poached salmon and David with some kind of pork dish. It turned out to be bacon in an onion sauce, which we later learned is actually a Swedish thing, as we spotted it on another restaurant’s menu. It was super delicious, as was my salmon dish, along with the salad and bread buffet, with its interesting selection of veggies and breads. We lingered over lunch, watching the snow blizzarding outside. We finally decided to venture out into the cold again, but thankfully our next stop was right across the square at Storkyrkan (the Royal Cathedral). The interiors were beautiful, dating back to the 13th century, with visible inlaid brick and ornate carvings. It’s perhaps most famous for a life-size wooden statue of St. George and the Dragon, which includes elements such as elk antlers as spines on the dragon. Definitely a impressive place. From there, it was right around the corner to Kungliga Slottet (the Royal Palace). There seemed to be a fair number of big trailers in the square in front of the palace, and we later learned that they’re holding the Royal Palace Sprint tomorrow (a 1 km cross-country skiing race around the palace, part of the Word Cup Series). As a result, some parts of the palace were closed, but we were able to get a discounted ticket. The Royal Apartments were the most interesting, with its elaborately painted ceilings and hilariously over-the-top chandeliers. David was fascinated by these tall, ceramic heating devices in most rooms, where a fire would be built in the lower chamber and result in heating the whole thing up. We were both pretty knackered–I was feeling quite physically exhausted–so we wandered back to check-in to the hotel and rest up. Our little cabin was adorably small but just fine enough for our purposes. The hotel was quite conveniently located, moored across the bridge from Gamla Stan. We attempted to get a bit of work done (I finished up my stats final) before trying to decide where to go to get some dinner. We had been forewarned that food is expensive in Scandinavia, but it was still quite jarring to sift through countless restaurant websites, with mains easily running at $40 a pop. It became a genuine challenge to find any place, even a pub of some kind, that served semi-reasonably-priced food. We finally settled on a pub called Oliver Twist, that wasn’t too far away and seemed to offer burgers and the like. After venturing back onto the snowy streets, meandering our way on a somewhat circuitous route, we found out and grabbed ourselves a pair of stools. We ultimately decided on basically a pair of appetizer platters for about $20 each. Mine included a selection of 3 little appies, including a mini elk burger with sweetened lingonberries, a slice of västerbotten cheese pie with sour cream and chanterelle toast (cream braised mushrooms on toast). David went with the game platter, which included a selection of reindeer sausage, elk sausage, elk roast beef and mature cheese. They weren’t massive portions, but they were super delicious. I’d never had elk before (which D suspects is actually moose, as they call them elk in Europe), but it made for a tasty burger. D was amazed to find beers from Left Hand Brewing out of Colorado and had himself a bottle ($12!) and I ventured a piccolo size of brut. We were soon comfortably full and made our way back to the hotel for the night.